Helicopter performance can be very deceiving. Large, fat and ungainly choppers can also be super-fast and highly maneuverable, even compared to their streamlined little cousins. The Sikorsky H-53 exemplifies this this truth with its massive six bladed rotor and large four bladed tail rotor. 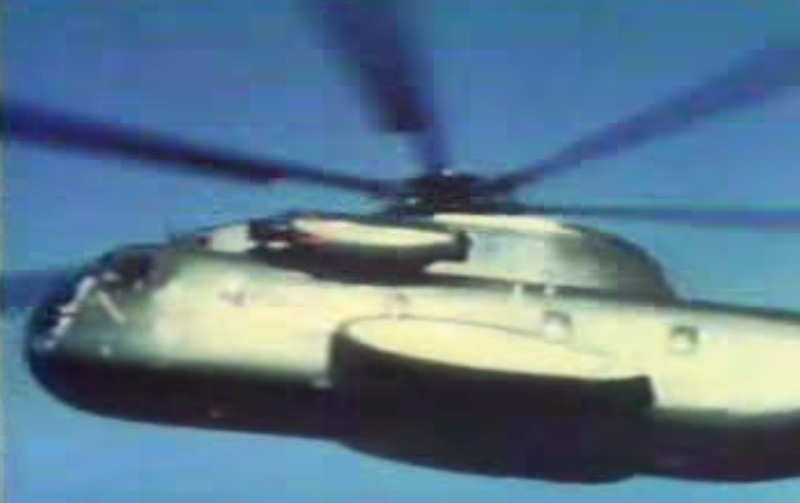 The video below shows the Sea Stallion going through aerobatic testing during the 1960s. The H-53 lineage is a long and decorated one, with the wildly upgraded special operations and combat search and rescue (CSAR) variant, the MH-53M Pave Low IV, being retired from the Air Force in 2008 and the USMC's CH-53D variant being retired in 2012. Today the H-53 continues to be the backbone of the Marines' heavy lift capability and the Navy's minesweeping force in the form of the triple engined CH-53E Super Stallion and the MH-53E Sea Dragon. The future remains bright for the type, as the ultimate H-53 iteration, the crazily powerful and fully updated CH-53K King Stallion will be taking to the air very soon. Hopefully the Sikorsky flight test team will put the King Stallion through its 'edge of the envelope' aerobatic paces like it did with its great granddaddy some 50 years ago. FUN FACT: The CH-53A had 5,700hp, the CH-53K has 22,500hp!